You are currently browsing the category archive for the ‘retreat’ category. God said … Stay with it. The wound is the place where the Light enters you. 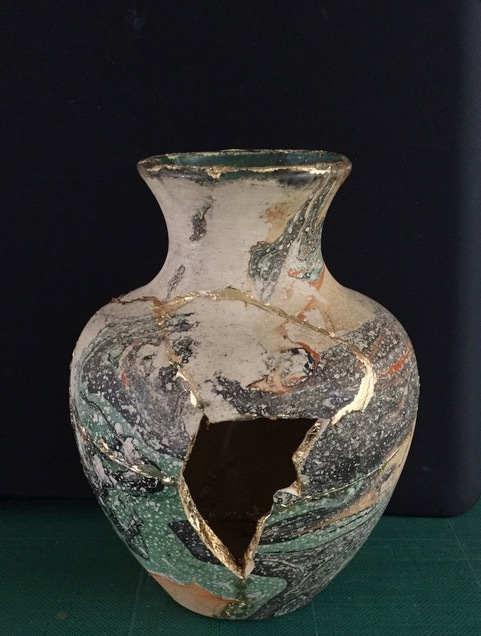 The image is of a broken vessel I repaired during a retreat I host annually at Mount Saviour Monastery. Last weekend twelve women gathered for this year’s Keys (unlocking your creative spirit) retreat. Our theme for this year was ‘Women as Vessels’. We explored being perfectly imperfect … perfectly unique … and more…. On the days when you feel ashamed of your scars, your mind only registering how ugly they are rather that the beauty they prove of you having survived, remember that there is an entire art form dedicated to filling the cracks of broken things with lacquered gold. And entire art form that proves that even the broken and damaged history of an object is beautiful and should be treasured. Remember how much more you are than an object. Remember your survival, your journey, your scars deserve to be treasured too.